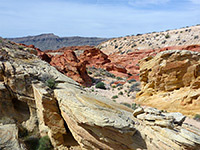 Created on December 28th, 2016, Gold Butte National Monument contains nearly 300,000 acres of unspoilt Mojave Desert landscapes on the north side of Lake Mead, creating a continuous corridor of protected land that extends eastwards from the NRA across to Grand Canyon-Parashant National Monument in Arizona, and onwards to Grand Canyon National Park. The preserve is approximately rectangular, 30 by 15 miles in size, encompassing, in its northern reaches, the southern end of the Virgin Mountains, which rise up to 7,946 feet (Virgin Peak), but the rest of the land is much lower in elevation, a mix of small hills and ridges, and wide desert plains sloping westwards to the lake and eastwards towards the Colorado River. 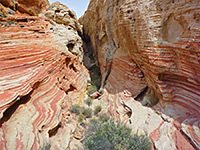 The majority of the exposed rocks are relatively dull in appearance, limestone and granite, in places partly metamorphosed, but in some places the brightly colored Aztec sandstone is exposed, the same strata that can be seen most spectacularly in the nearby Valley of Fire State Park. The outcrops are mostly bright red while some have shades of pink and yellow, and they form a variety of eroded formations, the most well-known though still quite hard-to-reach location being Little Finland. 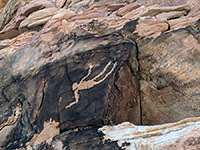 The sandstone is also notable for the many petroglyph panels which were etched onto the smooth cliffs and boulders by the Paiute peoples, up to 3,000 years ago, and it is the rock art, plus other associated ancient sites, that was one of the main factors in the national monument designation, along with the need to expand the protected area around Lake Mead to assist with wildlife conservation - there are several rare or endangered species inhabiting this area including the desert tortoise and mountain lion. 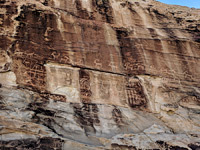 Also of note are more recent historic sites including abandoned mines and the ghost town of Gold Butte which, like the monument, is named after a minor peak towards the south side of the preserve, site of early 20th century gold and silver claims. In common with some other recently-created national monuments like Grand Staircase-Escalante and Bears Ears, reductions to Gold Butte were proposed in 2017, though it would seem that the portion of land removed would be relatively small, and in the northern reaches; the majority of the interesting and historic sites are in the center and south of the preserve, and will therefore be unaffected. This region of Nevada has always been lightly visited, a situation not much changed by the establishment of the national monument. Several long dirt roads enter the preserve from the east, starting in the Arizona Strip district, but almost all people approach from the northwest, along a paved route (Gold Butte Road) which forks south off Hwy 170 at Riverside, 3 miles from Interstate 15 exit 112. This road follows the Virgin River for a few miles then turns away, crossing plains and low hills to a four-way junction, continuing in semi-paved state for another 7 miles to a second major intersection, beside Whitney Pocket, a group of red Aztec sandstone mounds with primitive camping areas at the base. From here the main road, unpaved and increasingly stony, heads south for 20 miles to the base of Gold Butte, near the scant remains of the old mining settlement of the same name, while a rougher track (Cottonwood Wash Road), branching off a little way before, proceeds further south all the way to the banks of the Colorado River, at the upper eastern end of Lake Mead. 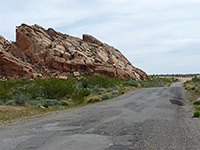 Many lesser roads leave the main route, nearly all requiring 4WD, and even Gold Butte Road, once past Whitney Pocket, generally needs at least a high clearance vehicle. 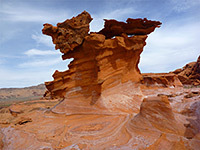 Apart from Whitney Pocket, the two most visited locations in the national monument are also towards the north - the jagged red sandstone formations of Little Finland, and a large group of petroglyphs spread out along a low rocky ridge about halfway between the other two popular places, accessed by driving up to 2 miles along a good quality track which forks southwards off the paved road 1.5 miles before Whitney Pocket. 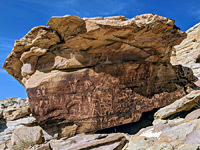 Named panels include Falling Man, 21 Goats, Amphitheater, Kohta Circus, Calvin's Rock and Newspaper Rock, all generally reached by short, easy (though unmarked) hikes of less than half a mile, but away from these more well-known places are hundreds more petroglyphs, indeed any group of light-colored sandstone boulders in the monument are likely to have some ancient rock art. Other recognised hikes lead to summits, sand dunes, sinkholes, springs, arches, narrow ravines, fossilized dinosaur tracks and old mines, plus the Gold Butte townsite (established in 1908), of which the only remnants are a few concrete foundations and rusty pieces of equipment. There are also several tracks that descend to the shoreline of the Overton arm of Lake Mead, within the NRA, but in general there are few other sites of special interest, and like many desert regions the greatest appeal is perhaps the general remoteness and isolation, and the wild, rugged scenery. Other activities include hunting (for big horn sheep), cycling and horse riding. 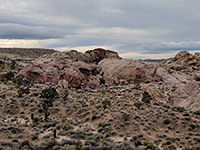 Rugged, undeveloped Mojave Desert region on the north side of Lake Mead; landscapes include sandy plains, isolated mountains, red rock formations and narrow canyons, plus Joshua tree forests and many rock art panels. Accessed mostly by unpaved roads.